Lighting a Fire: Another One Bites the Dust Linky! 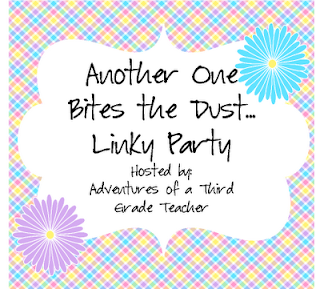 Another One Bites the Dust Linky! Using data to inform instruction. This year I finally feel like I got the whole data thing down. Understanding what to do with all the assessments we have to give can be overwhelming. This year my team and I decided to focus on what assessments we *really* need to look at deeply and which we can use for reference or a quick snapshot. Choosing one benchmark assessment that is administered three times a year helped to focus me as a teacher. I was excited by the growth I was able to see in all of the students- including kiddos that were high to begin with- and I felt like my direct instruction and small group instruction had a laser focus. I will definitely be doing that again next year! Working with my team. I have a small team of three third grade teachers but in the last 4 years my one teammate and I have had a cycle of one year teachers or substitutes. This enables my one teammate and I to bond closely but it was difficult for the person in the third position. This year we found the Curly to our Larry and Mo and she has already signed her contract for next year! I cannot tell you how having that perfect fit team has helped me grow as a teacher. We have collaborated on aligning instruction to student needs, we share students if we know one of us can give them the best instruction and we have a blast doing it! Math journals. I have already blogged about them twice before so I will spare the explanation but I am proud that I wanted to try something and I just went out and did it! I have some things I want to improve with them next year but overall they have been a success! Daily 5. I read the Daily 5 book last summer and I was very excited to put it to action in the classroom. Then, things just popped up- I couldn't tell you what caused me to put it on the back burner, but I did. I signed up for a Daily 5 and Cafe training in June and I am hoping to get some more information to help me impliment it because I still believe in the ideas. I ended up doing a mix between Daily 5 and workshops or centers which went well but didn't give the kids the choice that appealed to me in Daily 5. Parent communication. I talk with my parents but it isn't consistent. I want to do a better job of calling or e-mailing with the positives or funny anecdotes for them about their child. I hope to find a log or documentation system I can use next year to help keep me accountable. Lesson planning. I have so many ideas running through my head that I can't keep them straight. What I should do is write detailed lesson plans so that I can slot them in. Instead, I walk into school that morning and just decide to do something totally different. Most days, my lesson plans don't even make sense. I don't know about you but I have to turn in my lesson plans, so they are written I just probably wont be doing what I wrote in the plan book! UGH- that was my major frustration this year and I hope to be more organized next year! You'll love Daily 5 once it's up and running. I've never been to a training. I bet that will be a blast.